At the Hague Conference of 1907, one power had voted against every proposal to reduce the size of Europe's great armies and navies. That power was the German Empire, voicing the will of Prussia, its largest and most powerful state. Prussia owed its own existence largely to successful wars, and the German Empire owed its existence to Prussia. From a second-rate power in 1860, Prussia rose under Bismarck's policy of " blood and iron " to become the strongest military force in Europe. Bismarck accomplished this result by means of a military system which compelled every man in the country to serve a certain number of years in the army, and to be ready at a moment's notice to join his regiment if there came a call to war. With a great military machine fully organized and equipped, Bismarck was ready for the aggressive wars by which he meant to make Prussia the acknowledged leader of Germany. Aided by Austria, Prussia in 1864 tore from Denmark the provinces of Schleswig-Holstein; next Austria herself was crushed by Prussia, and ousted from the German Confederation (1866); and finally France was vanquished, robbed of two of her richest provinces, and compelled to pay a huge war indemnity as the price of peace. While his victorious armies were laying siege to Paris, the king of Prussia was crowned German Emperor in the ancient palace of the French kings at Versailles (1871). Out of these three successful wars, modern Germany emerged with boundaries greatly enlarged, and with an implicit belief in war and military force as the best means of advancing her national power. Bismarck's policy appeared fully vindicated, although it was a policy of fraud and trickery as well as of blood and iron. Bismarck had muzzled the press of Prussia, bullied its parliament, and overridden the will of its people; but Germany readily forgave his methods in view of the great material gains from his policy. The constitution of the new empire gave the German people almost no political power; for the Reichstag or Parliament was only a great debating society, the real rulers being the emperor and the Prussian military leaders. In the half century that followed the Franco-Prussian War, the German people patiently endured the burden of immense standing armies and the expenditures for a greater navy. They accepted this situation because they had been carefully educated to look upon war as something inevitable, as necessary to the future greatness of Germany. The schools throughout the empire mutilated the facts of history and geography to teach the children of Germany that France was a nation of weaklings, Russia a nation of slaves; that most of the peoples of Europe were descended from Germans, and should be united within the empire; and finally that Germany must have larger boundaries, a result which could only be accomplished by a victorious war. The powerful military leaders, aided by the German press, preached the doctrine that war is a necessity, "an ordinance of God for the weeding out of weak and incompetent individuals and States." Thus modern Germany came to believe that a nation is not great unless it has military power; and that this power gives it the right to deal with weaker nations as it chooses. If a weaker people possesses anything that the rulers of a stronger people want, those rulers need only plead military necessity, and no law of man or God may stay them from working their will. " Might makes right," said the German militarist, " and the dispute as to what is right is to be decided by war." Along with this doctrine that might makes right, that war is "a beautiful and holy thing," the Germans were taught another curious theory. This was that the German race is a race of superior beings as compared with other peoples; that its civilization (Kultur) is superior to all other civilizations; and hence that it is the duty of Germany to civilize and Germanize the world. "God has called us to civilize the world," declared Emperor William II; "we are the missionaries of human progress." It is not strange that this people, feeling themselves to be superior beings, came to believe that Germany did not possess the colonies, the commerce, and the influence which such a superior nation ought to have. "It is only by relying on our good German sword," wrote the Crown Prince, "that we can hope to conquer that place in the sun which rightly belongs to us. Till the world comes to an end, the ultimate decision must rest with the sword." Inspired by these ideals, the military party which ruled Germany had for many years planned an aggressive war which should give Germany her place as the foremost world power. Not content with the provinces of Alsace-Lorraine which she had wrested from France in 1871, Germany planned in this new war to steal the northeastern portion of France and to annex the whole of Belgium. This would give her immense fields of coal and iron ore, so necessary for industry, and especially for the manufacture of armaments; while the seizure of the Channel ports would enable her to hold a dagger at the heart of England. For Britain, with her world empire, was the enemy which Germany expected to attack eventually, although she hoped that this would be in a later war, after France and Russia were crushed. For was not England, a nation of tradespeople, among whom war was not glorified, already becoming decrepit? Was she not a "colossus with feet of clay," whose world empire would crumble before the might of the rising power in Central Europe? So the favorite toast among German officers was to der Tag, the day on which the British fleet should be beaten, and London occupied by a victorious German army. And after Britain, then America, peace-loving, idealistic, defenseless America, was to be taken in hand, and taught her proper and subordinate place in a world ruled by German power. "I shall tolerate no more nonsense from America after this war!" said Kaiser Wilhelm to American Ambassador Gerard, when President Wilson protested against the deaths of American citizens on the high seas from German U-Boat operations. On her eastern frontier, Germany's spoils of war were to be Russia's Baltic provinces, together with the territory to the southward; while Russian Poland was to become a vassal German state. A victorious Germany would then, as a matter of course, dominate Austria-Hungary, Turkey, the Balkan states, and Asia Minor, and thus form a great Middle-Europe Empire extending from the North Sea to the Persian Gulf. 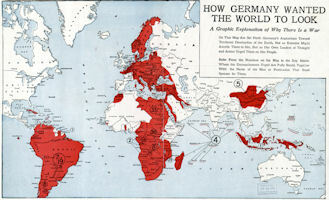 Nor did Germany intend to content herself with dominion over the continent of Europe. The French and Belgian colonies in Africa were to be seized, for the simple reason that Germany had few colonies, and wanted more. Even free America was sooner or later to be brought under the dominion of the new world empire. Using the German colony in southern Brazil as a base of military operations, all the valuable portion of South America was to be brought under German rule. A power which treated its solemn promise to observe the neutrality of Belgium as a mere " scrap of paper " could hardly be expected to regard the American's Monroe Doctrine seriously. If the United States dared to resist, there was the Kaiser's own word for it that he would tolerate no nonsense from America. German armies would occupy America's great coast cities, and the payment of a huge war indemnity would teach a proper respect for German Kultur. This ambitious program was not the dream of a few German visionaries or jingoes. It was an actual plan, carefully worked out in detail by the war-mad clique which ruled Germany. The German people, it is true, were not consulted in the matter; there was no need to consult them, for Germany was ruled, not by her people, but by the Kaiser supported by the military leaders and the Prussian aristocracy. 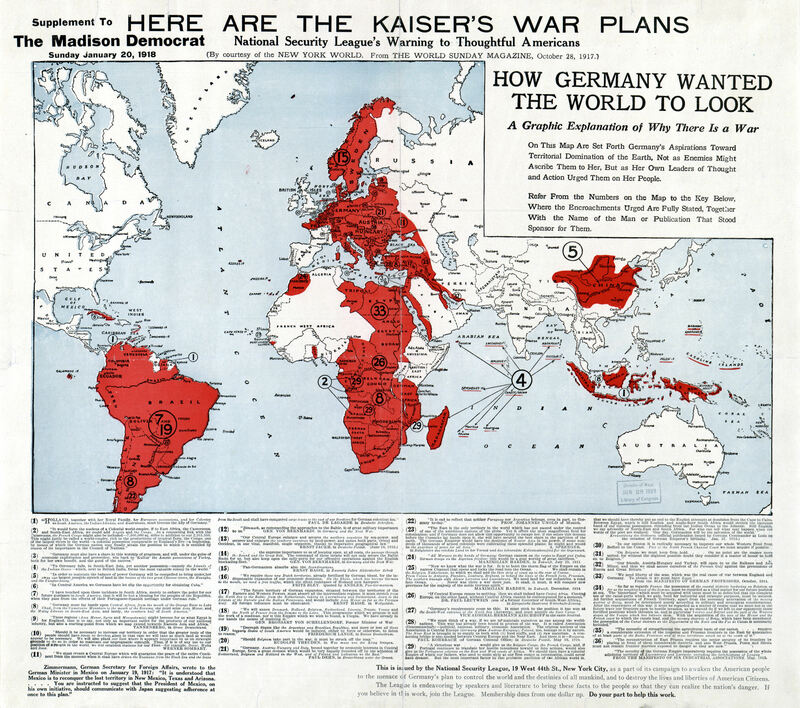 So audacious and so insolent is this German plan of world power that it startles our belief; yet in the fateful year of 1914 it came near to realization. "Now strikes the hour for Germany's rising power," wrote one of her editors as the German armies were launched across neutral Belgium to strike France at a point where she would not expect attack. Only the resistance of the Belgian army, the defeat of the German hordes by France in the battle of the Marne, and England's unbroken power on the sea, prevented Germany's dream of world empire from becoming an accomplished fact.